The historic island of knights and medieval nobility. A holiday in Rhodes, Greece is like a trip through history, starting from antiquity to the present. Rhodes is an island that combines the ancient monuments and the ultra-modern business facilities, making it the ideal destination both for vacationers and business travellers. Its long sandy beaches and beautiful natural features attract thousands of nature lovers, while its water sports and golf facilities are a magnet for outdoor sports aficionados. Rhodes (Rhodos) is one of the most cosmopolitan destinations in Greece. Its aristocratic, medieval atmosphere adds a unique air of elegance. Rhodes beaches are packed with VIPs and celebrities, who stroll through the streets in their designer clothes and mix with the other tourists in the evening. The main attraction on the island is the Rhodes Medieval City, which is one of the best-preserved monuments from the Medieval Era in Greece. No holiday in Rhodes Greece is complete without a tour of the Rhodes Medieval City. On Rhodes Island, Greece, visitors are offered a wide array of accommodations for all needs and preferences. Rest assured that you will find the Rhodes hotel accommodation that best suits your taste from the abundance of Rhodes hotels, apartments, rooms for rent, studios and villas on Rhodes Island. There is both luxury and discount accommodation in Rhodes, catering to all budgets. Hotels in Rhodes are experienced in offering accommodation to all kinds of visitors. You will get accommodated in luxury hotel rooms and suites, lovely villas and spacious apartments. For those on romantic holidays in Rhodes (Rhodos), there are cosy suites and rooms with idyllic views. For more information about Rhodes, Greece hotel accommodations, including hotels, luxury hotel resorts, discount hotels, apartments, studios, rooms for rent and villas, click here. The island of Rhodes, Greece has many stunning beaches with crystal-clear waters, satisfying all types of visitors. Most Rhodes beaches are sandy, while some also have a bit of pebble. Water sports facilities, umbrellas and chaise lounges are provided at the majority of the beaches. 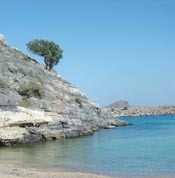 For more information about the great beaches on Rhodes kindly click here. Rhodes, Greece is famous for its cosmopolitan lifestyle and thus provides an abundance of entertainment venues. Along the coastline of the island, visitors can find quaint Rhodes restaurants, tavernas, cafés and ouzeries. For more intense Rhodes nightlife, the most popular areas are Faliraki, Ialyssos and Rhodes Town that are packed with clubs and bars open till daybreak. Rhodes Island also hosts a variety of traditional festivals and fairs, as well as cultural events. If you are interested in learning more about nightlife in Rhodes, click here. Rhodes is an island of rich history, since throughout the centuries a number of different cultures have influenced the architectural features of the island and the everyday life of the people of Rhodes (Rhodos) Greece. Whether on holiday or business trip, we suggest buying a map of Rhodes, Greece and setting off on a tour of the amazing ancient and historical sights around the island. If you are eager to discover all the exciting attractions in Rhodes, click here to learn more. The weather in Rhodes, Greece is quite mild throughout the year, with a bit of excess rainfall, which accounts for its lush green vegetation. It has the typical Mediterranean climate, with temperate winters and hot, dry summers. The northern Meltemi wind which blows in the Rhodes (Rodos) region in July and August, provides a cool breeze even on the hottest days. From spring till autumn, Rhodes is the ideal vacation spot, with clear sunny skies and warm waters. The evenings in spring and autumn are comfortable but cool and a light jacket is recommended. Rhodes is a very popular island in the Aegean and tourists can easily travel there either by plane or ferry. Most visitors prefer travelling to Rhodes by airplane. 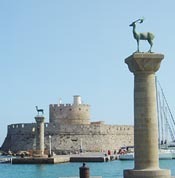 However, there are ferries connecting Rhodes with many main ports of Greece. For more information about ferries and flights to Rhodes, click here. Upon arrival at Rhodes Airport or Rhodes Port, you will need a safe and trustworthy rental car to take you to your hotel and to be your companion on your tour of Rhodes Island. For more information about car hire in Rhodes (Rodos), click here to be directed to our Rhodes Car Rentals’ page.